While mini-games have generated some ire in recent years, I’ll always fondly remember the first Mario Party; its highs, lows and the layers of skin it took off with reckless abandon thanks to the challenges that required you to rotate the analogue stick as fast as you could. In fact, I still bust it out every now and then if my friends want to play something a little more ‘retro’ and we’ve exhausted Mario Kart, although the results admittedly end up a little one-sided in my favour more often than they’d perhaps like to admit. 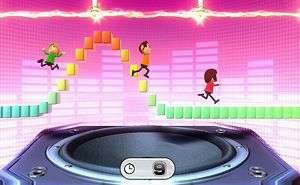 Luckily, there’ll soon be Wii Party U to enjoy once we’ve exhausted everything in Nintendo Land. The final product will include the board game layout that the Wii and Mario Party series have made wholly their own, but our demo consisted of three mini-games that’ll be present in the final product come October. The first of these was a two-player game of table-football that required both parties to hold on to the gamepad, with each side using their respective analogue stick to handle all the movement and controls for their team. While it was quite a fun diversion, it was one that was over all-too quickly thanks to the sluggish pace of both the ball and your footballers, but if they sped both of those up to allow for slightly more precise movements and more frantic action then I could easily imagine myself spending far more time with it. The second mini-game was a three-versus-one challenge which saw everyone kitted out with their own tank, with the three smaller players aiming to take down the gamepad-wielding user’s behemoth. Spicing things up significantly more is that the smaller tanks must hit the larger one a total of six times to destroy it, while the lone player is able to take everyone else out in a single hit at the cost of speed and mobility. While predictions can be made as to how it turns out in theory, in practice the results will often surprise you, although it has to be said that after all the times I played it was the player with the gamepad who turned up trumps more often than not, with some matches lasting a matter of seconds thanks to its ability to one-hit kill everything in its path. The final mini-game on display was by far the most fun, and one which will undoubtedly end up as a party-favourite; dubbed “Name That Face”, players swap the gamepad around as they have to take a picture of themselves pulling a face to a specific expression or emotion that they can only see on the touch-screen. Once they’re done, the others have to vote on what they think the face represents from one of four possible answers, with the caveat that the difficulty comes from the fact that all of the potential responses are similar enough that even if you’re relatively sure you know what face they’re pulling, any choice could be the correct one. I’m worried how quickly it’ll all fall apart if someone decides not to co-operate and opts to pull a completely different face or refuses to play along, but when everyone’s willing to participate and ham it up for the camera it becomes an insanely-enjoyable experience that’s exactly the kind of thing that only the Wii U can do. With over eighty new mini-games to try out, each potentially involving the gamepad in some way, there’s going to be plenty of content and ways to play with your friends if you’ve seen all that Nintendo Land has to offer and want to play something that requires a longer sitting. 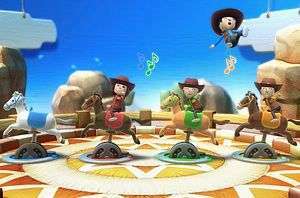 With plenty to showcase the unique capabilities of the gamepad, and a wide variety of mini-games designed for you to play with your friends, when Wii Party U releases in October it could easily end up as your go-to multiplayer game for the holiday season.